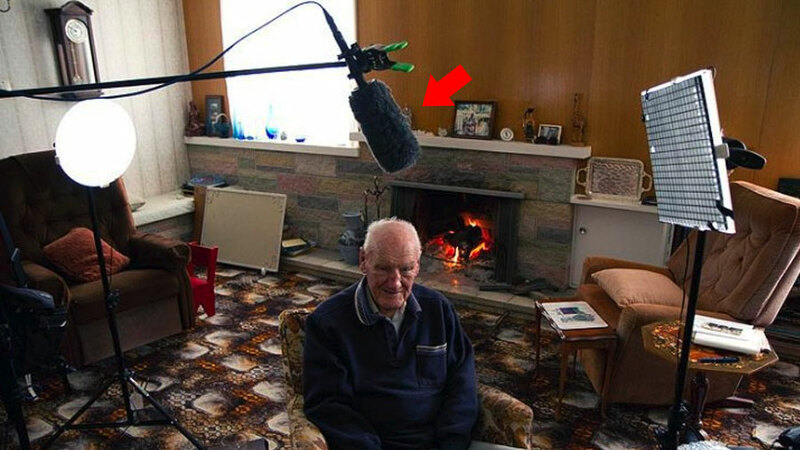 Getting great sound for documentary style sit down interviews is extremely important and if you’re reading this article you’ve probably already realized that on-board (on camera) microphones just don’t cut it. 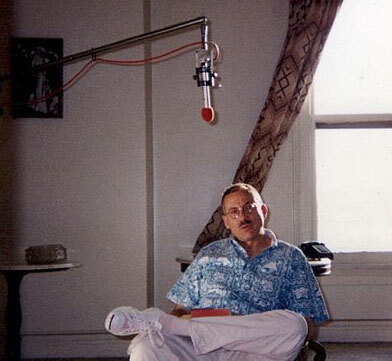 Generally speaking there are two common ways to mic a documentary interview: either with a lavalier microphone (skip down to this section) or a shotgun microphone suspended above the interviewee (skip directly to that section). Both of these approaches can work extremely well and both of them can also have drawbacks. In order to help you decide which microphone to use for an interview, we’ll do a how-to for each technique in detail below, and include links to all the gear you need to set each one up. 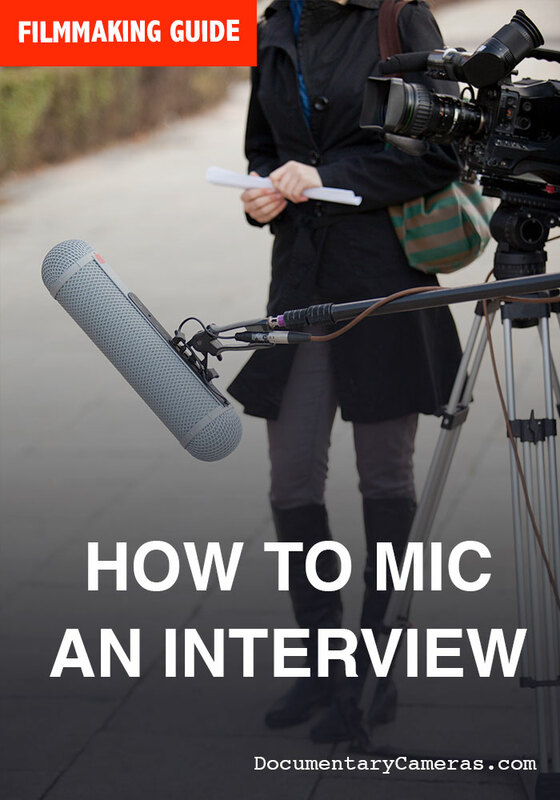 First up, let’s look at how to mic a documentary interview with a lav mic. Probably the most common way to capture sound for a sit-down documentary style interview is by affixing a wireless lavalier microphone to the interviewee. As pictured above, a lav mic, sometimes called a lapel microphone, typically affixes to the interviewee’s collar, shirt, jacket or tie. Pros to using a lav mic: If you’re doing a shoot with an interview subject that’s walking around and completing tasks as well as a sit-down interview, it can be convenient to keep a lav on them for the duration of the whole day. If you plan on doing some “walk and talk” interviews it’s also handy to use the same microphone. Using a wireless lav mic also reduces the number of cables that people can trip over on-set. Cons to using a lav mic: They take a few minutes of your subject’s time to set up properly and to wire the cable up someone’s shirt. Depending on the type of clothing a person is wearing, they may not be easy to rig up (women’s dresses are a classic example). 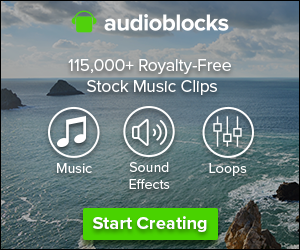 Some filmmakers find lav microphones tacky looking and depending on the aesthetic of your film or video this may be a consideration. Tips for using a lav mic: Always hide the cable between the microphone and the transmitter pack so you don’t have it dangling into frame which looks very tacky or amateurish (see photo). Disconnect the microphone and cable from the transmitter pack and give it to your interviewee to thread through or drop down their shirt, then reconnect the pack and give it to them to put in a pocket or belt. 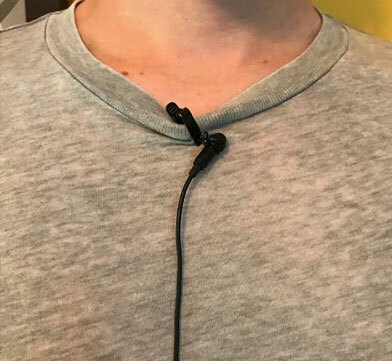 In some circumstances, it is possible to conceal the microphone itself although depending on the type of shirt or fabric the interviewee is wearing, it may lead to scratchy clothing sounds or muffled sound. Be sure to remind interviewees not to hit their chest because that will often create a heavy thump sound on the microphone. The Sennheiser G3 is the rugged workhorse of the documentary film industry. It’s probably the most popular wireless lav mic for indie filmmakers, documentarians and broadcast reporters today and for good reason. It features a plethora of frequencies for interference-free reception of crystal clear audio up to about 100 feet away with an easy to read display and menu navigation. The transmitter pack also features a “Mute” switch which allows your subject to turn off recording when they go to the bathroom or step out of the room to take a phone call without having to take off the lav completely or fiddle with turning it off. Both the transmitter pack and the receiver pack are powered by two AA batteries which typically last several hours before a swap is necessary. This kit comes with the clip on transmitter, a receiver with a camera mount plate that fits atop your camera’s hot or cold shoe mount and adapters for both XLR camera inputs and 1/8th (3.5mm) jack inputs. If the Sennheiser G3 is out of your budget range, we recommend the Movo 70 wireless microphone system. 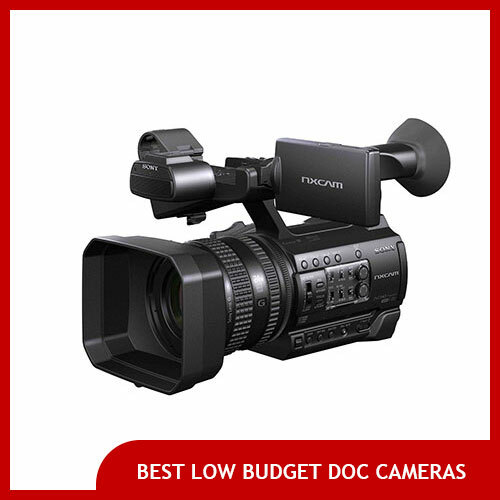 It features a wide range of selectable operating frequencies and it works with both professional XLR input cameras as well as 3.5mm inch jacks on DSLRs and other prosumer camcorders. Comes with a belt clip for the transmitter and a cold shoe insert to mount the receiver on top of your camera. Both the transmitter pack and the receiver use 2 AA batteries. Using a shotgun microphone suspended from on a boom pole or jib arm just out of frame is a slightly more complicated way of doing sound for a documentary interview but it can yield terrific results and it also has some special advantages over using a lav in some circumstances. For one thing, having a shotgun microphone already set up and suspended above the interviewee’s chair even before the interview starts can reduce the amount of setup time needed and make more time for actual interviewing if your subject is pressed for time (like a CEO or politician). 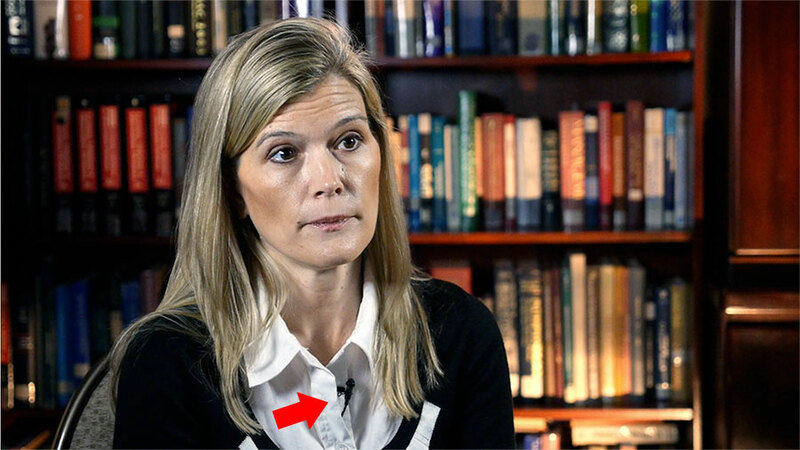 Pros to using a shotgun mic: Reduces the amount of setup time while your interviewee is in the room and can eliminates any risk that your subject may feel uncomfortable about putting a cable down their shirt. Using a shotgun mic for an interview also means it doesn’t matter what type of clothing your interviewee is wearing because you don’t have to affix anything to them or hide any microphone cables. Finally, using a shotgun mic also allows you to rotate in and out several interview subjects in the same space very quickly if you have a “hot seat” in the same place and want to capture many interviews in a limited period of time without rigging and re-rigging everyone for sound with a lav. Cons to using a shotgun mic: You will need a jib arm and a stand in order to suspend the microphone above your interview subject. This means more gear to buy and also pack and transport, assuming you’re traveling to the interview location. If you’re not careful it can also mean you’ve got another cable for someone to trip over (the XLR cable). Tips for using a shotgun mic: Always tape cables to the floor using a wide gaffer’s tape so people can’t trip over loose wires. Also be sure to weigh down your lighting stand with film sandbags to reduce the risk of it falling over. The first thing you’ll need is a good quality stand with a jib arm/boom pole to suspend the microphone from. This stand can get up to 13 feet high with an arm that can reach out up to 6.9 feet in length. It also comes with a sandbag although you may want additional film sandbags to use around the base of the stand too. You’ll also need a mount to hold the shotgun microphone in place at the end of the boom arm on the stand. This basic shockmount will do the trick, plus it’s adjustable which allows you to customize the angle at which your microphone is directed. It’s wide enough to handle most microphones and quite sturdy. 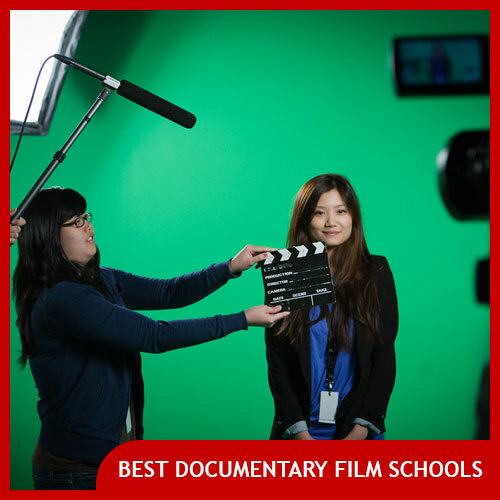 Of course, you’ll also need a good quality shotgun microphone for capturing great documentary interview sound if you use the boom pole method. If you don’t already have one, the Sennheiser 416 is one of the industry workhorse shotgun microphones used in film, reality television, and documentary. It’s super-cardioid so its pickup pattern will be precise, meaning background noises will be mostly eliminated. The 416 is an industry standard and a great documentary interview microphone although if it’s out of your budget range, consider the Audio Technica 897 instead. If you don’t have a nice long XLR cable to connect this microphone to your camera, you’ll need that too. Should the interviewer’s voice be heard on screen? That’s an aesthetic question that nobody but the director can answer. However, if you plan to include audio of the interviewer asking questions during interviews, we recommend micing them up properly (often with a simple lav microphone). Poor audio can take the viewer out of the film faster than anything else and it feels very amateurish. For more on this topic, we’ve written a whole article answering the question should the questions be heard on screen? Is there any reason I shouldn’t just get a cheaper wired lav microphone instead of a more expensive wireless one? Although wired lapel microphones do exist, they’re somewhat old fashioned and leftover from the days when there was a more substantial price difference between wired and wireless models. Back in the old days wired mics were way cheaper and so documentary filmmakers used them more often but they have several drawbacks. First, although you won’t run into any wireless frequency interference problems, they do have limited range: however long your cable is. Second, it adds another cable that the person you’re interviewing can trip over or forget is connected and start to walk away with, yanking your camera or a light stand with them. Finally, even though you might save a few dollars by opting for a wired microphone, you will sacrifice versatility, which we’d argue is unwise. Even though a wired microphone might work all right for a sit-down interview, you may not be able to use it for other types of shoots later when a wireless solution is required, like walk-and-talk interviews or covering events. Is it possible to wirelessly operate a shotgun microphone on a boom pole so it doesn’t have to be connected to my camera? Yes, there are solutions for this. See our article on wireless shotgun microphones on boom poles. Note that they may add a little bit of extra weight to your shotgun microphone so if you have it suspended on a jib arm or boom pole above your interviewee, you’ll want to make sure your counterweight is heavy enough so it doesn’t come crashing down on their head in the middle of an interview. What is the best way to mic an interview with two or more interviewees? Two-person or group interviews are notoriously difficult to shoot for a variety of reasons. But if you really need to do one, we recommend having a sound operator with a boom pole who is manually moving it from person to person to capture whoever is speaking at that given time. With only two interviewees it may also be possible and economical to use dual lav microphones– one for each of them. What is the best way to mic an interview where the interviewer is seen as part of the film? In films or videos with a host or reporter who is seen on screen interviewing people, we recommend recording sound for both the interviewer and the interviewee in the same way. If you’re planning to use a shotgun mic on a boom pole suspended above the interviewee’s head to capture their sound, we suggest you do the same with the interviewee. If you’re planning on micing one of them up with a lav mic (and honestly this is more common for TV-journalism style two person interviews) then we suggest doing that with both of them. 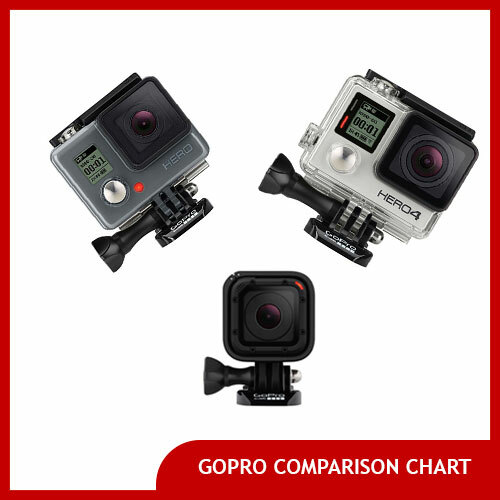 The reason you want them to ideally match is that if both the interviewer and interviewee talk a substantial amount and both are seen on screen, it may be jarring to have two very different sounding microphones for each of them, and it may seem as if they are not even in the same space together.